In front of just over 10,200 fans, Oakland, California's very own Olympic Gold medalist Andre Ward reached the goal he and trainer Virgil Hunter set out to conquer more than fifteen years ago, totally dismantled veteran warrior Mikkel Kessler at the Oracle Arena Saturday night via eleventh round technical decision, earning the WBA super middleweight title as well as securing great position for himself in Showtime's Super Six World Boxing Classic. Ward completely dominated from the outset, utilizing his jab and superior handspeed to totally befuddle the reigning champion. In the first round, Ward pushed the jab out and followed it with right hands, and as he grew more comfortable he began to throw lead right hands and hooks as well. Ward opted to switch to southpaw midway through the round and landed the left jab with regularity out of that stance. Ward was surprisingly comfortable on the inside against a fighter many considered the stronger man. Kessler had some success going to the body early on in the fight but that was the furthest he would get offensively. Kessler had perhaps his best round in the second, but Ward was successful with right hooks and boxed beautifully around the ring. In the fourth round, Kessler landed a good clubbing right midway through the round, but Ward came right back with three punches of his own. The referee signaled that there was a cut caused by a punch, but in between rounds the referee seemingly changed his mind and ruled it due to a headbutt, and that the cut was opened further by a punch. Kessler was fighting Ward evenly for much of the fifth, but Ward was landing the more impressive punches, causing Kessler's head to snap back numerous occasions with crisp jabs and right hands. Ward turned southpaw at the end of the round again. Ward started widening the gap in the sixth, as Kessler seemed more and more hesitant to engage with him. Ward continued his dominance in the seventh, as he began to lead with right hands as well as mix in some left uppercuts. Ward's hand speed had Kessler in trouble all throughout the bout, and Kessler was unable to close the gap in hand speed. Kessler looked like a beaten fighter by the ninth round, seemingly going through the motions as the younger and fresher Ward pressed forward with his attack. Ward began fighting like a guy who was anything but weary of Kessler's power, firing off quick one-twos and circling around Kessler in the center of the ring. Ward continued his dominance into the championship rounds, outboxing Kessler while staying out of the range of Kessler's right hand. Midway into the eleventh round, Kessler was deemed unable to continue due to a cut caused by a headbutt, forcing the fight to go to the scorecards. The official scorecards read 97-93, and 98-92 twice for the newly-crowned WBA champion out of Oakland, California. Ward walked away from the bout nearly unscathed, with nothing more than a mouse appearing outside of his right eye. Kessler was much more worse for the wear, having secured more than a few cuts throughout the bout. With the win, Ward positions himself in the Super Six tournament as a favorite to advance to the semi-finals considering his next two opponents, Jermain Taylor and Andre Dirrell, both lost their “Stage One” bouts and were seen as the weaker links in the monumental tournament. Ward is a fighter who has been criticized throughout his career for numerous things, but few can look at this fight and take something away from Ward who thoroughly dominated a guy that many pegged as the favorite to win the tournament. “They had questions about my chin early on. I fought Miranda, and he's as hard a hitter as they come and I got hit more in that fight than I wanted to, and came right back and still didn't get credit,” Ward said. 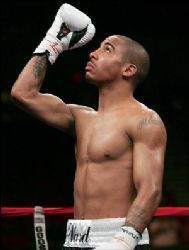 It only took twenty-one professional fights and two world championships [one in Athens in 2004 and the super middleweight crown he lifted on Saturday], but Ward will assuredly be getting his proper credit after delivering a virtuoso performance over a tough opponent. In a scheduled eight-round junior middleweight bout, Daly City, California's Karim “Hard Hitta” Mayfield [11-0-1, 7 KOs] started out slowly before laying a beating on Santa Barbara, California's Francisco Santana [11-2, 5 KOs] via fifth round technical knockout in a rematch of a March 2008 bout that Mayfield won by razor-thin split decision. The first round saw both guys fight tentatively with Karim landing the only two meaningful punches of the round, two clubbing overhand rights. In the second round, Mayfield worked his jab and followed up with left hooks. Both fighters held a lot throughout the fight until they opened up in the fifth round. Mayfield started the action with a sweeping right hook that landed on the chin of Santana. Mayfield followed with a flurry against the ropes that featured hooks to the body and clubbing overhand rights that eventually dropped Santana. After his opponent returned to his feet, Mayfield went in for the kill and landed a wicked left hook to the body that setup another right hook and a follow-up overhand right that put Santana down a second time and prompted referee Dan Stell to wave off the fight at 2:27 of the fifth round. In a four-round super middleweight bout, Oakland, California's Tony Hirsch [10-3-1, 5 KOs] notched the biggest win of his career in outgunning former #1 rated welterweight contender and Julio Cesar Chavez, Jr. opponent Jose Celaya via a unanimous decision victory. In an over-the-weight four-round lightweight affair, Antelope, California's Stan Martyniouk [8-0, KO] outboxed Anthony Martinez [21-33-3, 9 KOs] of Turrialba, Costa Rica. Martyniouk fought at a measured pace in the opening round, moving beautifully while mixing in varied punch combinations. Martyniouk stuck to his game plan in the second, moving around the ring before planting his feet and firing off left hook and left uppercuts at will. Martinez had a few moments in the round where he trapped Stan in the corner and fired off a few good body shots. The third round saw Martyniouk fairly dominate the round behind his jab and superior handspeed. In the final round, Martyniouk trapped Martinez against the ropes and unleash a flurry of punches before Martinez postured against the ropes. All three judges scored the bout a shutout for Martyniouk, 40-36. UBR scored the bout 40-36 as well. In the opening fight of the night, Mel Crossty [4-0-1, KO] of Cincinnati, Ohio scored an early knockdown in round one en route to a unanimous decision victory over the game but outmatched Carlos Herrera [2-3, KO] of Oxnard, California in a super featherweight attraction. Crossty's knockdown of Herrera in the opening round was more of a glancing blow that caused the glove of Herrera to touch the canvas, prompting the referee to issue a count. The two fighters opened up in the third with both guys landing vicious shots. Crossty boxed a little more in the final stanza but Herrera landed a big overhand right every so often. The official scores of the bout were 39-36 and 40-35 twice. UBR scored the bout 39-36 for Crossty. Saturday night's card was promoted by Goossen-Tutor Promotions in association with Sauerland Event and Antonio Leonard Productions. The main event was televised on Showtime Championship Boxing as part of their Super Six World Boxing Classic as well as internationally.